Based on the popular Prominence-i integrated HPLC platform, the compact BioEthanol Analyzer is an advanced tool for real-time monitoring of the fermentation process in bioethanol production. Remote monitoring of the BioEthanol Analyzer via the i-Series web interface or LabSolutions Direct provides instrument status and chromatogram information from anywhere using any smart device or PC. 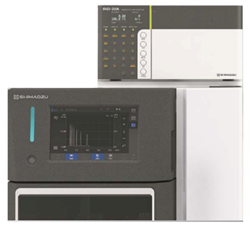 Shimadzu Scientific Instruments announces the release of its new BioEthanol Analyzer. Based on the popular Prominence-i integrated HPLC platform, the compact BioEthanol Analyzer is an advanced tool for real-time monitoring of the fermentation process in bioethanol production. Real-time monitoring allows process controllers to take immediate action when issues arise. Remote monitoring of the BioEthanol Analyzer via the i-Series web interface or LabSolutions Direct provides instrument status and chromatogram information from anywhere using any smart device or PC. Unusual results can be seen immediately and the necessary corrective action can be taken. The analyzer’s autosampler features an open-access mechanism that makes it possible to add sample vials easily, even when the system is operating. The ability to quickly and conveniently load samples enables the acquisition of real-time analytical results, resulting in more efficient monitoring and improved productivity. The Bioethanol Analyzer also features a high-performance refractive index detector with excellent baseline stability and a wide linear range. In addition, a built-in ECO mode reduces power consumption and mobile phase usage to save on operational costs. LabSolutions software provides for easier, more intuitive operation. The uniform graphical user interface on both the integrated touch screen and the LabSolutions computer screen allows users to easily create analytical methods using the same workflow. In addition, the quick batch window displays the sample rack mounted in the system, with samples in the queue color-coded according to sample type. Sample vial numbers and batch sequences are entered through this quick batch window, allowing any user to create batch files quickly and easily. For more information on Shimadzu’s analytical solutions for the renewable fuels market, go to http://www.ssi.shimadzu.com/industry/industry_energy3.cfm.